This point is driven home in Spectrem’s new report, The Influence of Knowledge and Investment Risk on Advisor Dependency, which demonstrates the solid relationship between an investor’s knowledge level, risk tolerance and dependence on professional assistance. In general, the less an investor knows, the less willing that investor is to take investment risks and the more likely that investor is to depend on the services of a financial advisor. Among all investors with a net worth of more than $100,000, only 61 percent of those who claim to be Very Knowledgeable use an advisor. That percentage climbs to 88 percent of those who claim to be Not Very Knowledgeable. 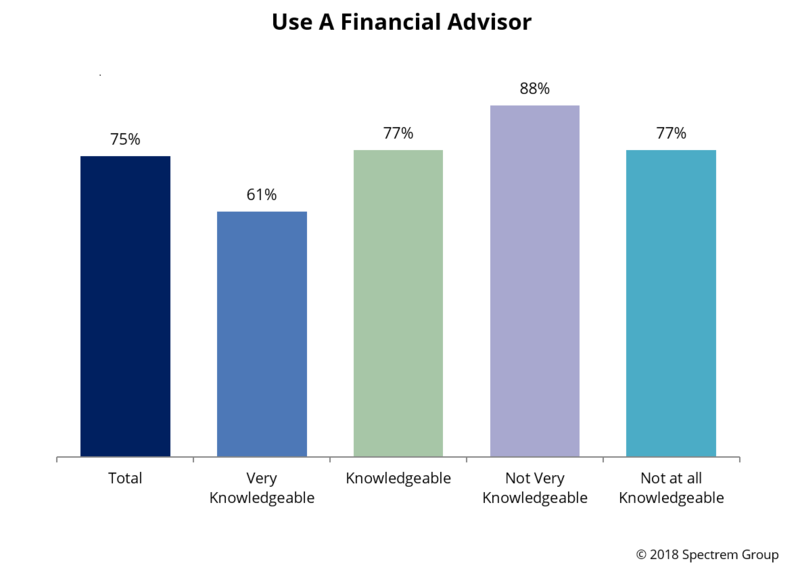 Obviously, knowledge does not preclude advisor usage, but it makes advisor usage less desirable or necessary in the minds of investors, apparently. It is noteworthy that the percentage of investors who claim to be very knowledgeable and do not use an advisor is the same (61 percent) as those investors who claim to be Most Aggressive in their investment decisions and do not use an advisor. The correlation between knowledge and risk tolerance shows up in multiple ways in the Spectrem study.